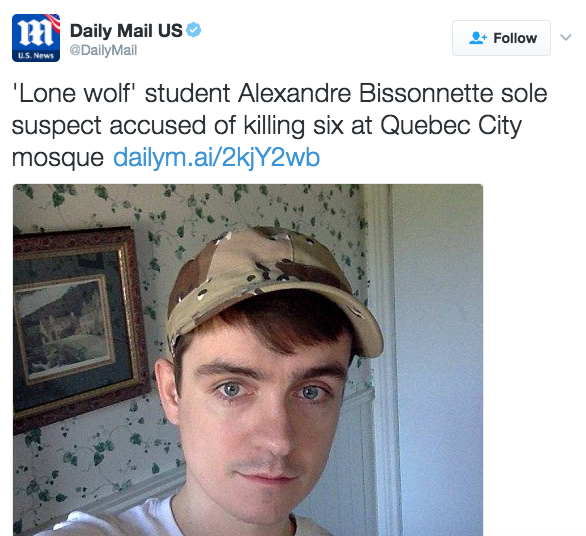 “Lone wolf.” “College student.” “White man.” “Shooter.” “Far-right.” “Suspect.” These words have been deployed to describe Alexandre Bissonnette (pictured), who recently killed six Muslims inside a mosque in Quebec. His social media activities show that he trolled refugees, supported Trump and other far-right nationalists, and fancied himself as a Christian crusader. Imagine if the script was flipped. If a Muslim carried out a shooting in a church, terms like “Islamist,” “radical Muslim,” and “jihadist” would be thrown around. Why don’t we have powerful words like that for young white Christian men? Why do people point to their mental health and not their political or religious beliefs? Why do we blame Islam when a Muslim commits an act of violence but not Christianity or Western culture when a Christian commits an act of violence? Why the double standard? Bissonnette is a terrorist and he should be treated as such. The scourge of white supremacy violence will not go away until we identify it for what it is – TERRORISM. What can be done to tackle the rise of white supremacist attacks against ethnic and religious minority communities? I am interested in hearing your views. What I do know is that white supremacy infused with Christianity is a major problem and its proliferation must be addressed. This is a “silent threat” that has a thunderous impact on innocent people. Christianity and Islam does not encourage these type of actions. The only word is terrorism. Even my view? Of course Bissonette is a terrorist but Jesus wasn’t and Mohammed was (“I was made successful by terror” etc). I have seen nothing in the media suggesting that Bissonette thought he was doing God’s will killing Muslims but every time Muslim terrorists kill Christians they claim to be doing it for Allah. So why did he kill Muslims? I don’t know and I don’t suppose any of us will until the details are leaked or come out in court. For all we know his being a Christian could be completely incidental as it is for many people who oppose Islam (peacefully) solely because of what Islam is and does around the world. You have jumped to the conclusion that his being a Christian was a motivating factor. Why? One of his last posts on Facebook was a picture of a Christian Crusader. Bissonnette posted “hallelujah” alongside it. Only a fool would say that Christianity had no part to play in his actions, just as we would be foolish to say that Islam has no part to play in the actions of some Muslims. The difference between us is that you think Islam has EVERYTHING to do with the actions of Muslims. That is intellectually lazy and careless. You “Islam-splain” everything and you blatantly disregard any discussion of intersectionality. I must confess I was unaware of the Crusaders and “Hallelujah” thing (on rereading your post I now see that you wrote “and fancied himself as a Christian crusader”). That is unfortunate, nevertheless I do not consider the Crusades to be central to Christianity. Indeed, it is not difficult to argue that they represent departures from it. If this young man sees the Crusades as authentic Christianity then I think he is as mistaken about that as he is in his actions. I take the centres of the two religions to be their respective founders. On the one hand we have a man who supposedly allowed himself to be crucified for the benefit of others and on the other a man who, according to the Koran, ordered crucifixions (5:33). Is it possible to imagine a starker contrast? Could two men be further apart on any moral scale? Both are held up to their followers as examples to follow. When Christians kill they do it in defiance of Jesus’ example. When Muslims kill non-Muslims they are following Mohammed’s example. I didn’t simply decide one day to loathe Islam. It was the sight of a British soldier beheaded on the streets of London by two Muslims quoting Koranic verses which prompted me to inquire into Islam, something I had never given two thoughts before. I would have been happy to find that they had misunderstood Mohammed but I found just the opposite, that they appeared to be in full accordance with his example and teachings. You only manage to avoid the same conclusion by preferring the very dubious Mohammed of the Covenants to the Mohammed of the Koran and the Hadiths. You are in a tiny minority on this and I still hope for an answer from you on why Mohammed wrote a message to the Monks of Mt Sinai promising his protection and excusing them from paying the jizya tax 17 years before Mt Sinai came under Muslim control. But to answer your charges, I do not think that Islam has everything to do with the actions of Muslims but I do think that on a sliding scale of piety, those who are closest to Mohammed’s example are the jihadis and those who are furthest away are those Muslims who find it possible to live with non-Muslims without feeling obliged to subjugate them. As for intersectionality, I believe it to be an academic fad which manages to persuade Blacks, women, gays and Muslims that their interests are all aligned as co-victims. Considering the history of the Muslim slave trade and Islamic views on women and gays, I think of it as a pen containing three sheep and a wolf. Now that you know Mohammed did say it, does it make any difference to your view of him? ASSALAMU ALIKUM [.JESUS] MAY ALL THE BLESSING AND PEACE BE UPON HIM SAID ,seek the truth and the truth will come to you,AMEAN and his brother MOHAMMAD [pbuh]and their brother MOSES [pbuh] and their father [IBRAHAM] [pbuh. ]…SO do your owen research and be active like DR Craig Considin. all THE MERCY AND BLESSING AND LOVE AND PROTECTION OF THE ONLY GOD AND ALL HIS ANGEL BE UPON YOU DR CONSIDIN. .
From my own point of view, I think you are not well verse in knowledge and you need to seek more knowledge and understanding the knowledge you have seek for so that you will leave the mediocrity Society. I don’t mean to offend you but it’s just a single explanation and advice. Why did you pick a single verse with you not understanding the verse or reading what message comes prior to the verse you single out or what message comes after it. Readers are not like that. Let me tell you this again. Qur’an is the world of Allah and Hadith is the saying of the prophet. This is what comes before the verse of the Quran you single out. In this part of Qur’an, Allah is talking about Cain and Abel. How Cain kill Abel and get confused on how to buried it and………………………. The human being is Allâh’s noblest handiwork. He is the zenith of His creation, its aim and end. Humanity is Allâh’s vicegerent on earth (2:30; 17:30). It is therefore natural that the religion, which has put human beings on such a high pedestal, should also attach great importance and sanctity to human life. According to Islamic teaching, of all things, human life is the most sacred and inviolable (see also 17:33 for the gravity of the crime of murder). In the verse, the word nafs stands for a human being, but may also refer the any great reformer or any prophet. As the word Nafsan here is used as an indefinite, then according to Arabic syntax, the word must refer to the Jewish plots to kill the Holy Prophet (pbuh), but does so without detracting from the universal validity of the injunction against murder. The words كَتَبْنَا عَلَىٰ بَنِي إِسْرَائِيلَ “We laid down for the Children of Israel” also refer to its earlier enunciation.